It’s All About the Dawgs! What? He doesn’t give you loves and hugs? You need to watch sadder movies! To purchase your cookbook, visit these stores…. AMAZON: if it falls on the floor, it’s mine! ifitfallsonthefloor@gmail.com and order your book directly! Enter your email address to trail this dawg tail. Be notified of new barks and wags by email. Two of the most beautiful and very spoiled Bernese Mountain Dogs. Their adorable, funny antics will bring chuckles and smiles and sometimes a few tears as you read their tales. True stories, hilarious escapades, and entertaining dog adventures, all chronicling their heartwarming and humorous capers, along with their playful frolics that often times land these fearless canines in the dog house. 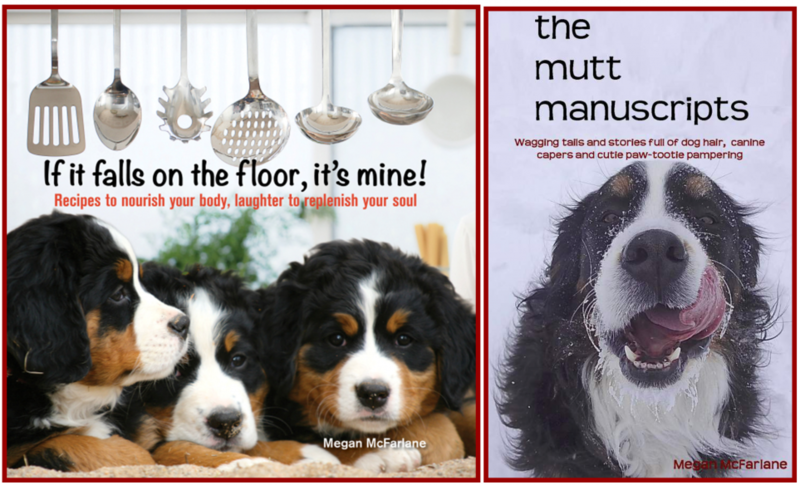 Touching and tender, amusing and comical, these moving narratives and snippets of their lives impart bow-wow wisdom and show the loyalty and love between man’s best friend and their human care givers. Where has the bone gone? Our dogs are our pride and joy and I enjoy sharing their stories with you on my blog. Please do not use or copy any of my photos or text without my given permission as each picture and story is a sweet memory. Unauthorized use and/or duplication of this material (photography and writing) without express and written permission from this blog’s author and/or owner is strictly prohibited. Excerpts and links may be used, provided that full and clear credit is given to "If It Falls On the Floor, It's Mine!" with appropriate and specific direction to the original content.